Taking a break from gardening on Saturday I decided to capture the fleeting beauty of the grape hyacinths. I didn’t plant them, they must have been here when we moved in eleven years ago. But I never noticed them until about three years ago when we did some landscaping and removed some sod underneath an old Rose of Sharon. Since that time they’ve naturalized like crazy. 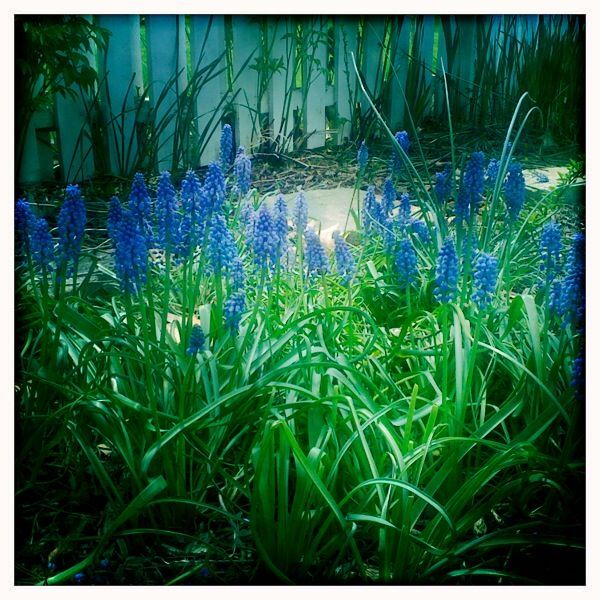 Grape Hyacinths are actually Muscari. They get their name from the Latin musca meaning musk because of their scent. Personally, I don’t think they smell at all like musk and are much more like their true Hyacinth cousins in that department. Grape hyacinths are known by the scientific name Muscari Neglectum which works for me because it means less work. I NEGLECT-UM and they naturalize and look gorgeous under a shady tree all on their own.